Cities need good routes for processions and should ask garden designers to help with them, because garden design has so often been the crucible for urban design. 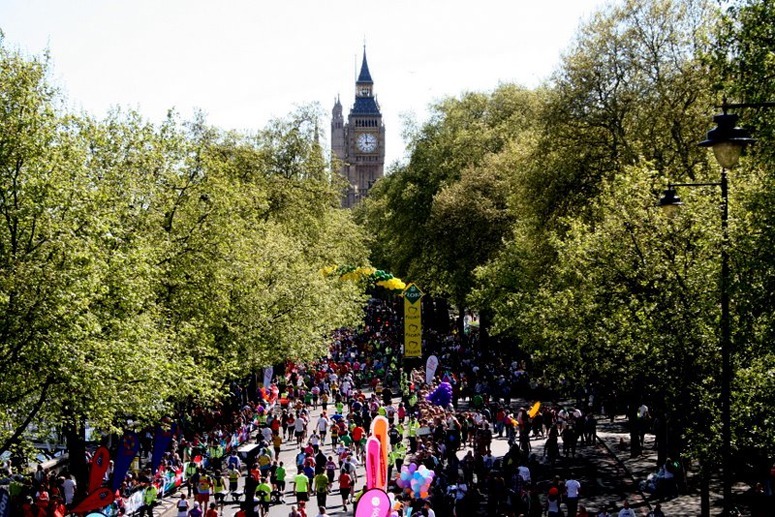 The magnificent route in this photograph is shown on 26th April 2009 being used for the London Marathon. The route is on the north bank of the River Thames, with Big Ben in the background, and is one of the most comprehensive urban design projects London has ever seen. Most days of the year the place is made wretched by heavy traffic. But when closed for processions it is a wonder – which should be made permanent because, as Jane Jacobs remarked, urban designers should plan for the attrition of automobiles by cities. The land shown in the photograph was ‘reclaimed’ (ie stolen) from private gardens and from the River Thames. The project was designed by an engineer, Sir Joseph Bazalgette, and begun in 1862. It includes a low level interceptor sewer, an underground railway, a wide road and a retaining wall built with Cornish granite. This entry was posted in Garden Design, Urban Design on 28th April 2009 by Tom Turner. I wish I could tell you whether this rotting barge is a ‘wreck awaiting removal’ or a ‘scheduled monument awaiting a viewing fee’. I fear the former. 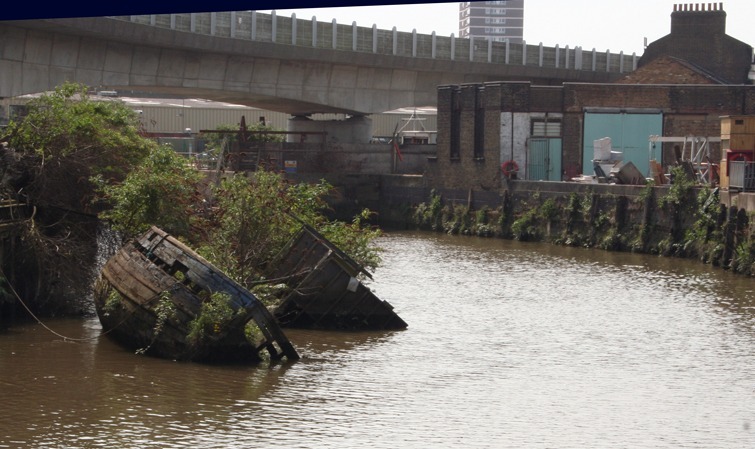 Deptford Creek is a very interesting place. Henry VIII established England’s first Royal Dockyard here. Peter Romanov, son of Alexis I, was born in the Kremlin and came to Deptford in 1698 to learn shipbuilding. This was 4 years before he became the Czar who became Peter the Great. An exceedingly strong man, he worked, drank and womanized with the shipwrights. From 1871 until 1914 Deptford was the City Corporation’s Foreign Cattle Market. But almost all the evidence of this fascinating history has gone. The Docklands Light Railway was as heartlessly perched over the river as if it been in Tokyo. Then, with the 1990s YBA’s and Britart, Deptford became an artist’s enclave. Most certainly, the old ships should not be removed. But nor should they be restored. They should be allowed to sink, ever so gradually, into the mud. 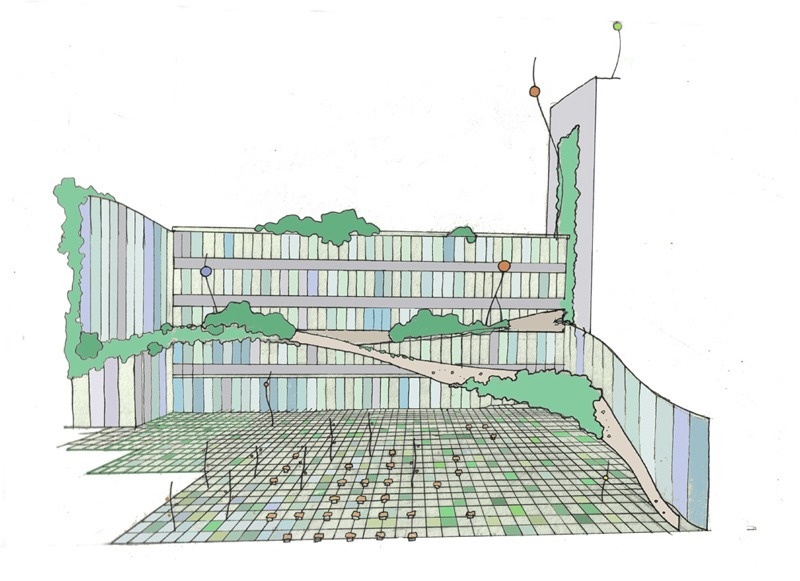 This entry was posted in context-sensitive design, landscape and garden archaeology, Landscape Architecture, London urban design, Urban Design on 23rd April 2009 by Tom Turner. Since Gulf and Asian landscape architecture are improving, it may be a good time to dwell on past mistakes. The above photo is of the east corniche in Abu Dhabi. It was designed in conjunction with major traffic routes and exemplifies what goes wrong when landscape architecture work is supervised by firms of engineering consultants. The east corniche ‘park’ lies beside a 12 lane carriageway and flyover. It is a horrible place to be, especially during the rushhour. Pedestrian access just about impossible. Abu Dhabi is not short of money but this is a terrible way to waste water, space and resources. The ‘park’, better described as a ‘GARK‘, is ‘decorated’ with petunias, lawns and a fountain. 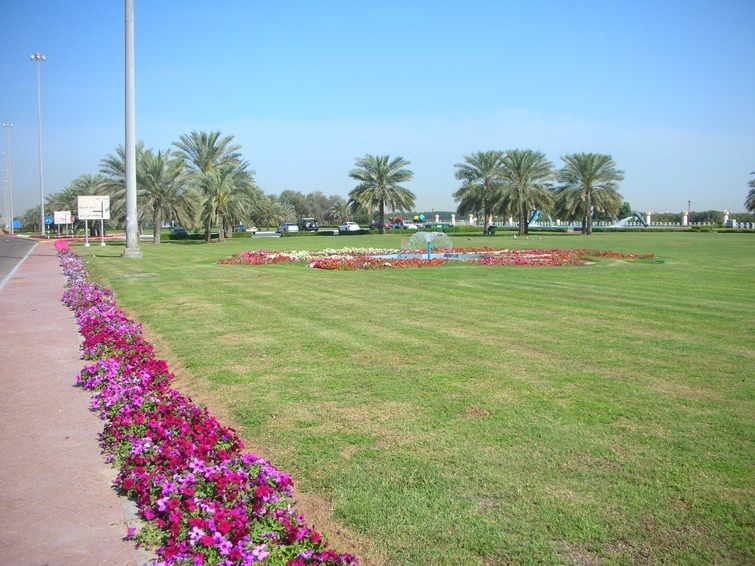 Abu Dhabi is developing a grey water mains water supply but many lawns of this type are watered with drinking water. Grassland irrigation is calculated at 12 litres per square meter per day, which is 4,380 litres of water per square metre per year. Since there are about 58,000 sq m of grass, it must require about 250 million litres of water per year. In desert conditions, petunias probably require more water. Desalination plants dump their excess salt back into the Gulf. This will turn the mangroves yellow in perhaps 50 years. Beyond the gark, to the right, you can see the tops of the mangrove swamps which border the Abu Dhabi Gulf coast. The mangroves grow practically without maintenance in seawater. They are an ecological treasure chest and very beautiful. One wonders if the ‘designer’ of the Corniche east park ever woke up and felt really stupid about what he or she had done. It is not too late to commission a landscape architecture firm to claim the gark for the mangroves. This entry was posted in Asian gardens and landscapes, context-sensitive design, Garden Design, Landscape Architecture, Public parks, Sustainable design on 16th April 2009 by Tom Turner. 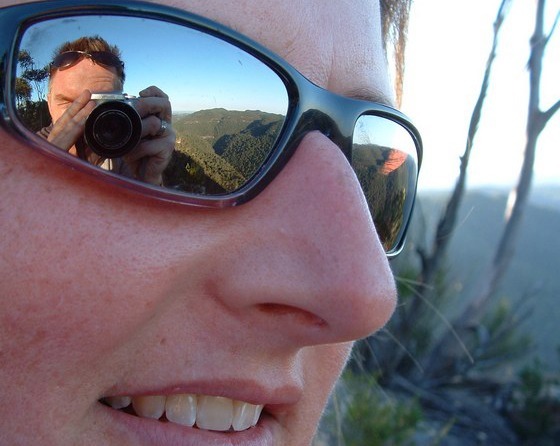 Is this how we understand landscapes and gardens, natural and designed: through a friend’s camera reflected in our own glasses? This entry was posted in Garden Visiting, Historic garden restoration, Landscape Architecture on 10th April 2009 by Tom Turner. One way of promoting green roofs and investigating the question of their accessibility is to look at some of the excellent examples which now exist. 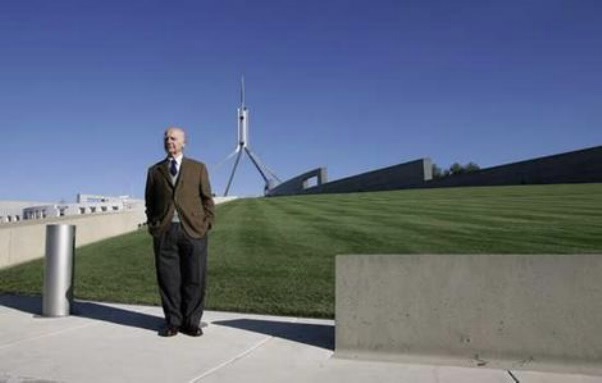 Parliament House, Canberra is probably one of the world’s earliest and most successful green roofs. The Parliament House building was constructed in 1988 for $1.1 billion. The reason for the design of the green roof at the time was not due to sustainability as an imperative, rather it was conceived of “in order to preserve the shape of the hill on which it was built.” The Parliament building was constructed into the top of the hill and the roof was grassed over. I suggest an online design competition to produce and debate alternative forms of cover which would satisfy the perceived need for a more sustainable ground cover and satisfy the demanding eye of the architect who rightly has regard to the heritage value of his work and to its design integrity. This entry was posted in Landscape Architecture, Sustainable Green Roofs on 9th April 2009 by Christine. The UK Landscape Institute should consider itself in the position of Robert the Bruce in a cave on Rathlin Island in the winter of 1305 watching a spider trying to make connections from one area of the cave’s roof to another. The LI has achieved good things but has suffered defeats. It should seize the breathing space offered by the recession to think again and plan for the future. ‘If at first you don’t succeed, try try again.’ Are the problems interconnected? Does the Constitution need to be revised? The LI has lost too much money. It is out of touch with its membership. Its public profile is too low. Its recruitment is far too low. Major opportunities in garden design and landscape planning have been missed. It has too little influence on government policy. There is no PPG Note on landscape matters. UK landscape architects have not achieved the international renown enjoyed by other categories of British designer (eg architects). The LI Journal is a monthly disappointment. The organization is timid and tepid: not hot and yet uncool. A symptom of the malaise is the complete redesign of the logo, journal and website every few years. Landscape design should be a classic brand – with new leadership and more responsive organization. The forthcoming Council elections are a time for change. 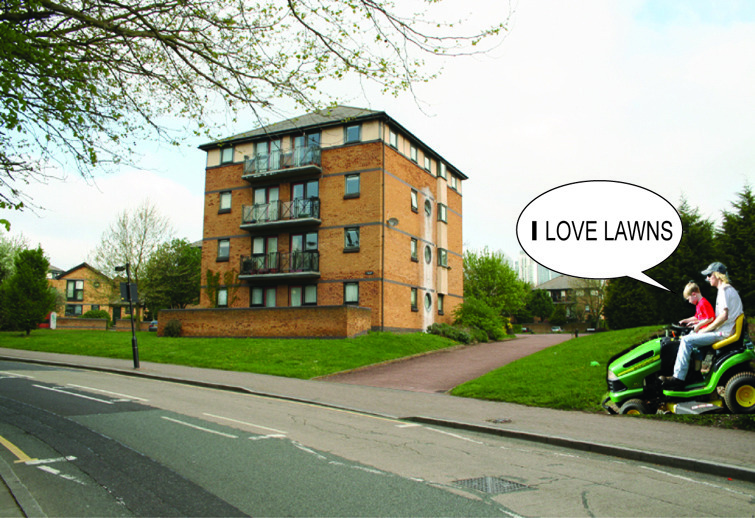 This entry was posted in Landscape Architecture on 9th April 2009 by Tom Turner. This entry was posted in Garden Design on 7th April 2009 by Stefan. i dont know how we all still feel about moon gardens but here is my latest drawing of the Waterloo site. i think it includes a lot of the ideas we were discussing, but admittedly, leaves some out. in the end, i decided to do what felt right for the space itself. you all might not agree of course. i’m suggesting metal grills for the ground surface as these will reflect available light upwards and lighten the space, perhaps with room for plants to grow inbetween them in an ecological fashion? this could be interesting as different/more plant species would grow in different parts of the ‘garden’ according to the available light and microclimate. parts (or perhaps all) of the metal surface could be also galvanised to show the reflection of the moon at night, tracing its path across the sky. i still think the site could be improved a lot with the demolion and repositioning of key buildings ( and god its such miserable architecture, who would miss it?). but perhaps these steps would bring back life to a dead zone? But we want to make it better! Please help us – with reviews, ratings, photographs and descriptions. The original idea for the garden finder was to provide links to gardens from my online book English garden design: history, philosophy and styles since 1650. [This book also appeared in print, in 1986 and is due to be revised and re-published]. Since 1998 we have published over 25 online books and there is an interesting job to be done in linking them to and from the garden finder descriptions. This entry was posted in Garden Design, garden history, Garden travel and tours, Garden Visiting on 4th April 2009 by Tom Turner.